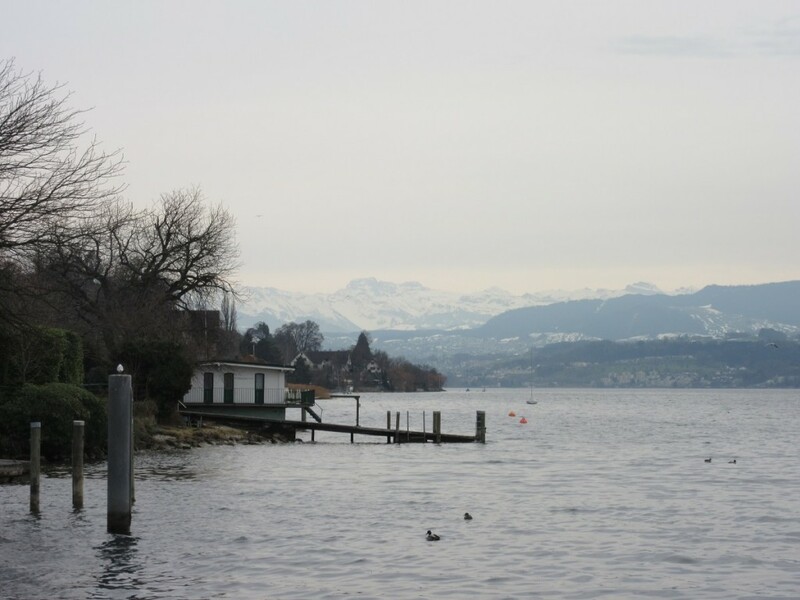 Dan’s business trip to Zurich came up rather suddenly and I politely waited for him to say “Pack your bags we’re heading to Switzerland!” When that invitation was not forthcoming, I announced “I’m packing my bags and heading to Switzerland, Dan!” Geeesssh! Sometimes ya just gotta do what ya gotta do. Know what I mean? Honestly, he was so busy and intent on getting done what he needed to do in prep for his trip that he didn’t have time to plan for my going with him, but as soon as we were in the car he was happy I was with him. And I was thrilled to visit Suisse land with Dan, my man! It does take a bit of work to get these adventures underway. Can Udo and Klaus care for the cat? Yes! 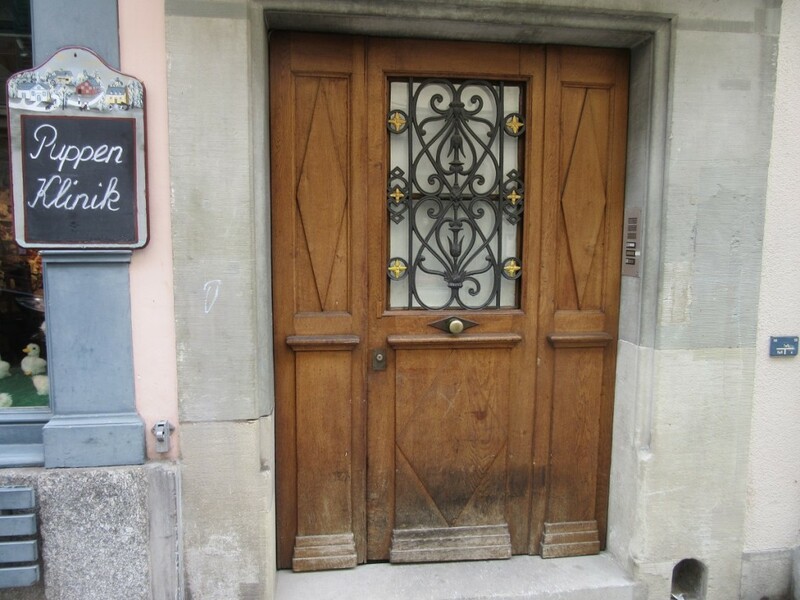 I phoned Katia at the Hundepension and OH NO…..I had to leave a message and hoped she would return my call. Yes! There is room for Gracie at the Kennel. Now, run to the bank so I can buy extra cat and dog food and get euros to pay the Kennel as it is a cash only country. I dropped Gracie off and she pitched a fit. “You told me we were going for a ride in the car. You tricked me Mom!” Run back home, start the dishwasher, put the clothes in the dryer, pack my suitcase, grab my Crochet bag, grab my Computer, grab the Coffee making bag and run to the car. 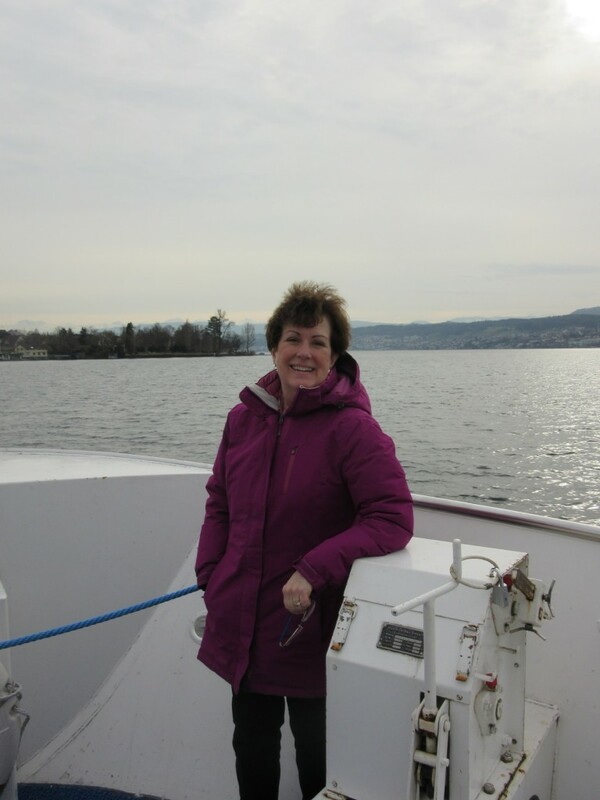 And….we….are….off on another adventurous journey in Europe! 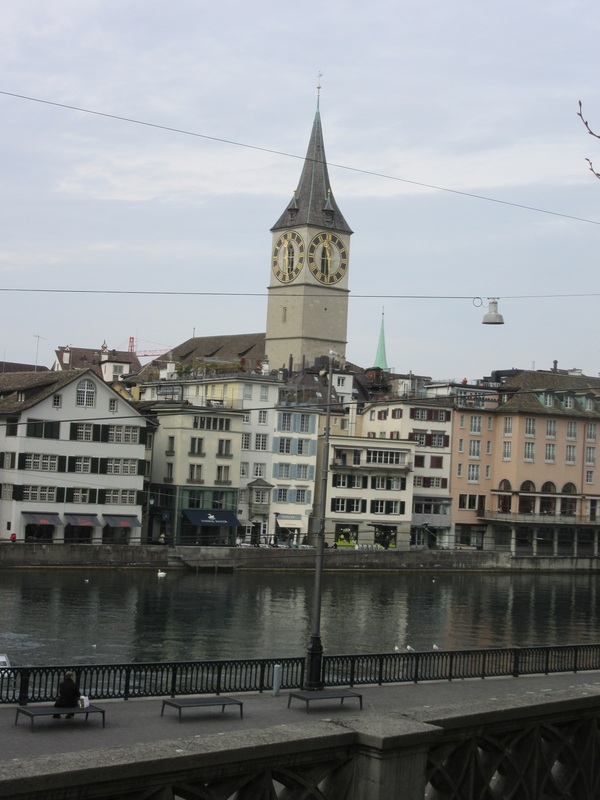 The largest Clock Face in all of Switzerland. 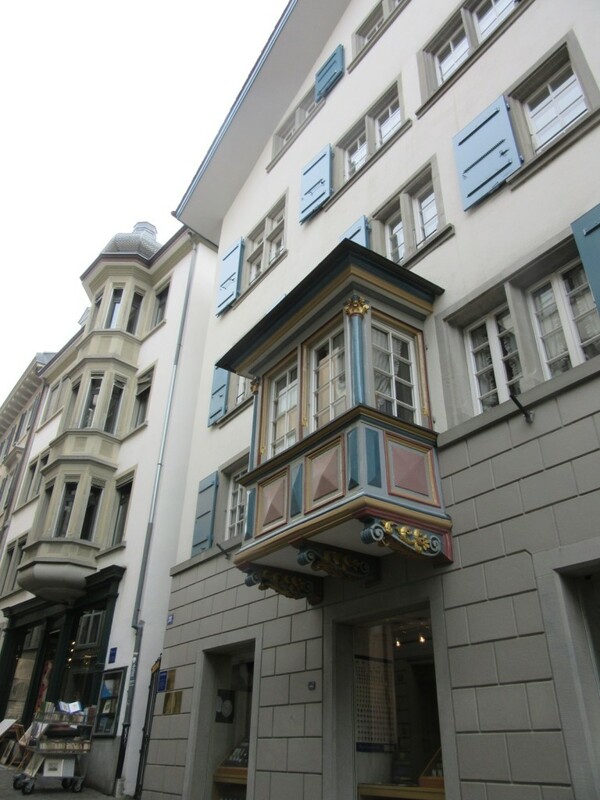 Made so everyone in Zurich could see the time wherever they were in the city as no one had watches back when she was built. Driving to Zurich took about 5 hours. 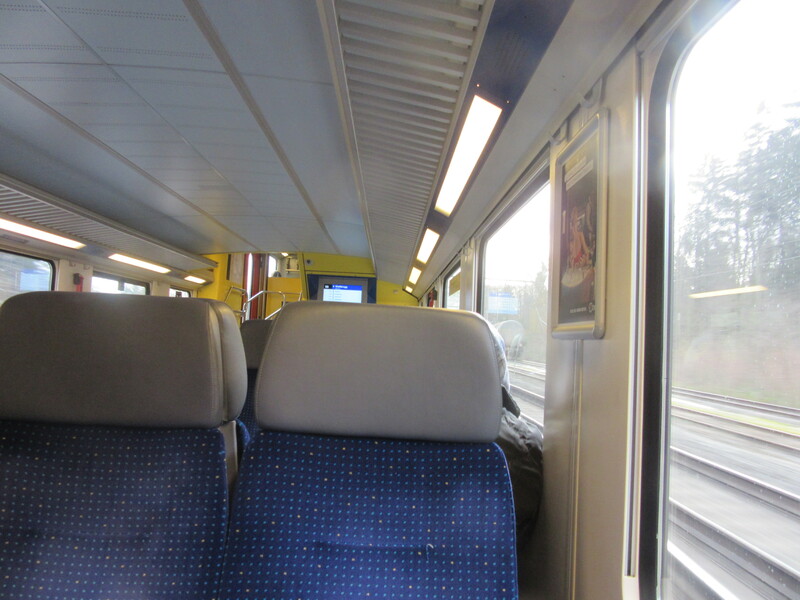 We went down through Germany, briefly into Austria and then to Switzerland and on to Zurich. Our Hotel was out by the airport putting us close to where Dan worked and a train ride into the city for me. No worries, I have quickly learned how to get this train stuff down. Just ask the Front Desk and they provide a map, directions, the number of the train and even tell you how many stops to count before getting off at the Hauptbanhof, or Train Station. 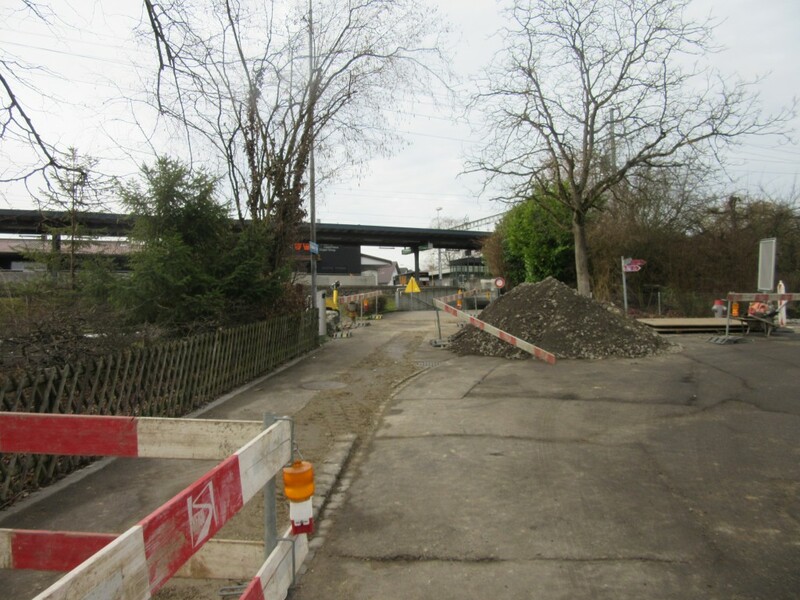 But first I have to find the train station. Seriously? There’s a train station here? Sure was! The trains are clearly labeled as to their destinations and once on board it’s all good. These trains even have screens to tell you the what the next stop is as well as announcing it overhead. The trains come in underground and there are several levels. The noise, commotion and vast numbers of people can be overwhelming but I just take my time to look around, read the signs, get my bearings and off I go! I took the escalators up to the cavernous first floor and found the Tourist Information Center. A nice lady provided all kinds of valuable information and said “Just go outside this door, bear right then turn left. 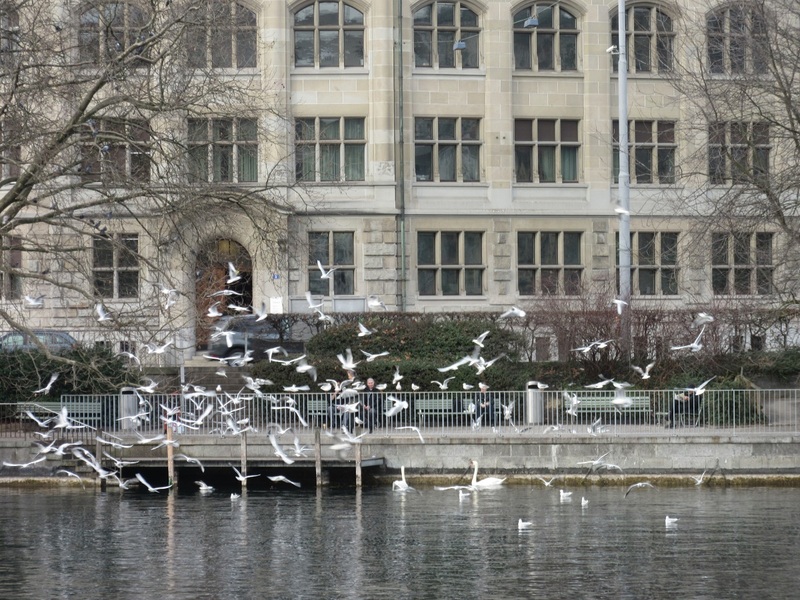 Cross the river Limmat and turn right onto the Promenade. 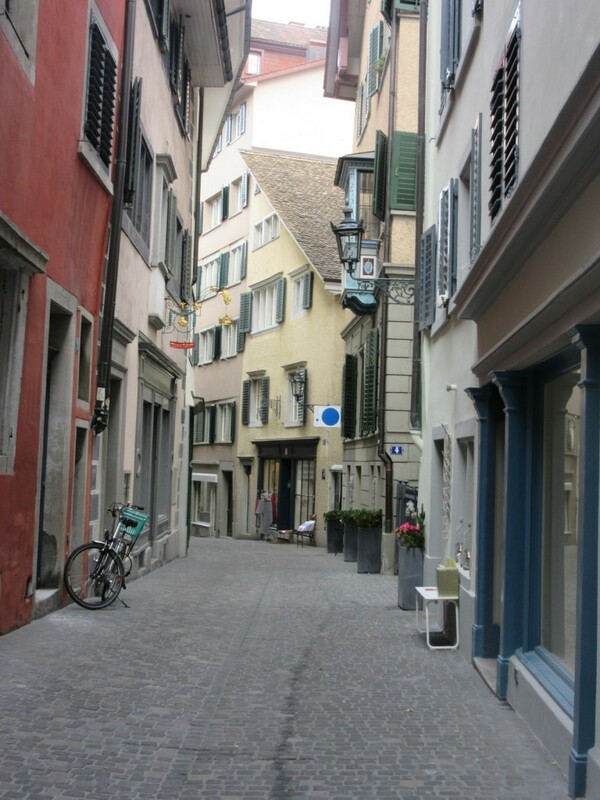 All of Old Town Zurich is in the tiny streets and alleyways off the Promenade.” So that’s what I did! 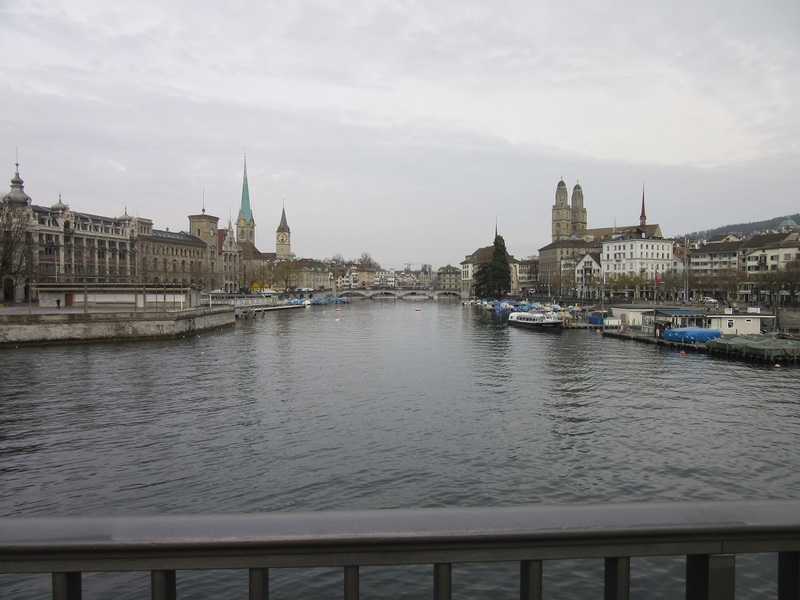 I crossed the River Limmat which divides the city. There are several bridges along the Promenade. What’s the first thing I see? Yeppers. 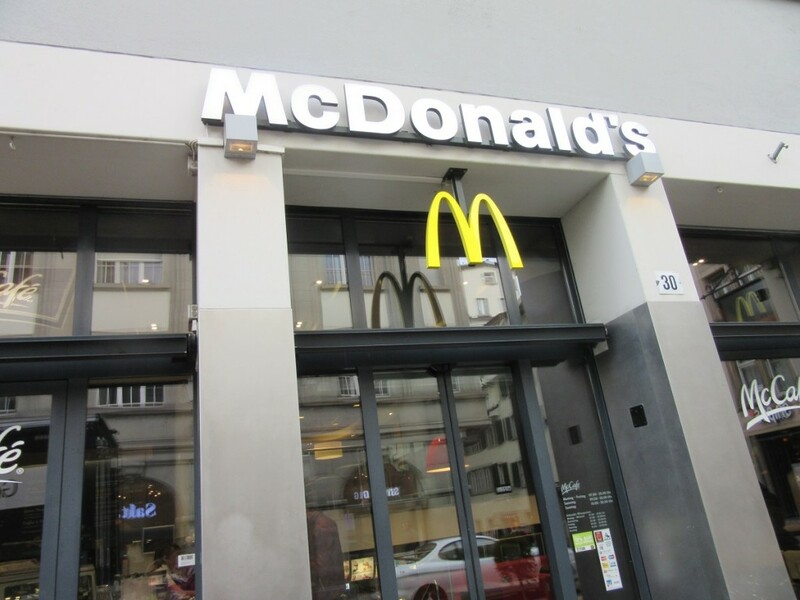 Micky D’s and Burger Kings are in Zurich too! The sky was overcast and grey but the temperature was very mild. Unusual for this time of year and no snow! 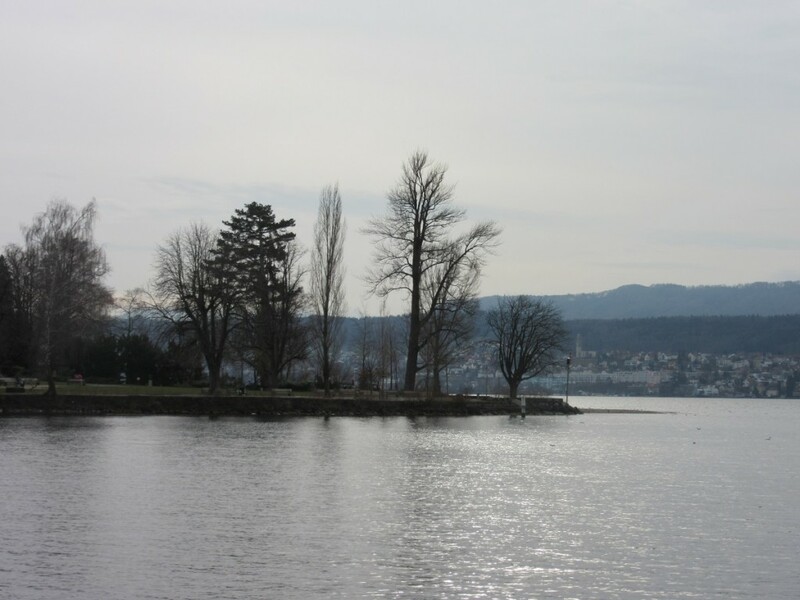 There are Promenades on both sides of the river and people were out strolling and enjoying the scenery. 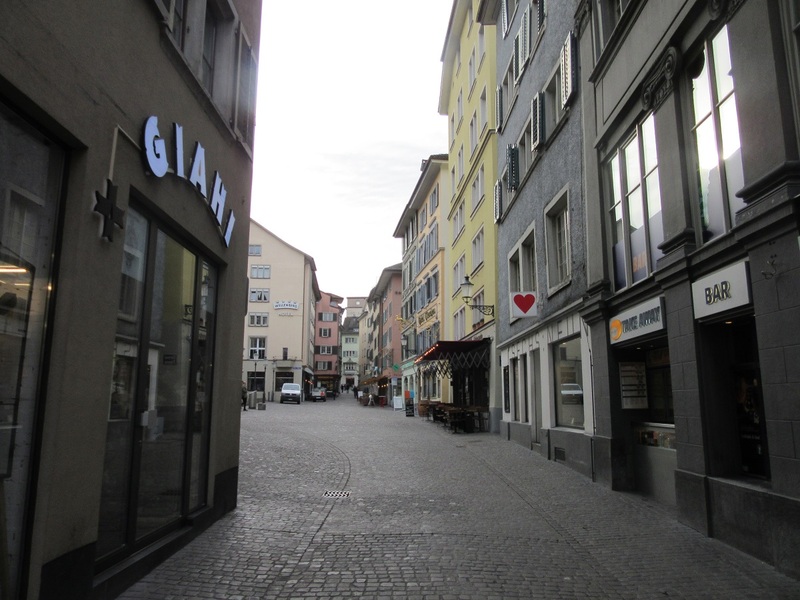 The Reformation began right here in Switzerland as the Country rejected Catholicism. 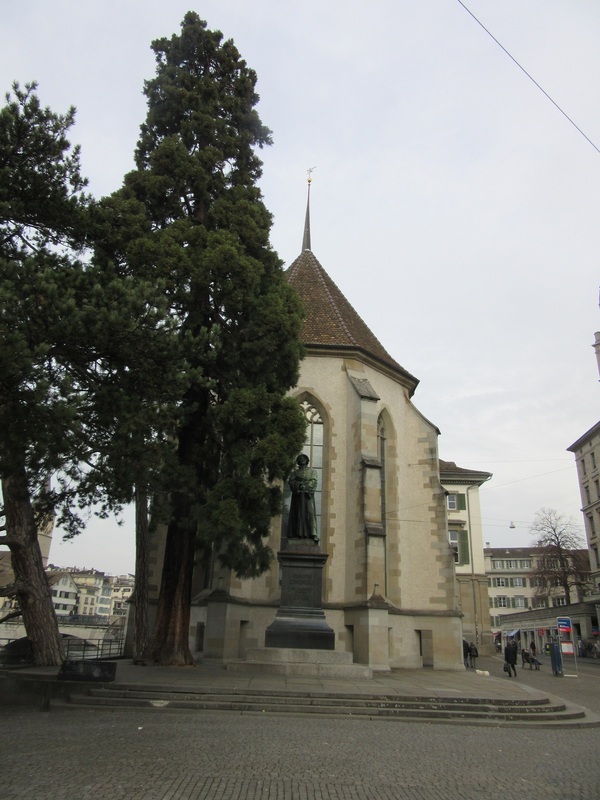 Today Switzerland remains a Protestant Country. This Church is just magnificent, but you’re not allowed to take pictures inside the Protestant Churches. 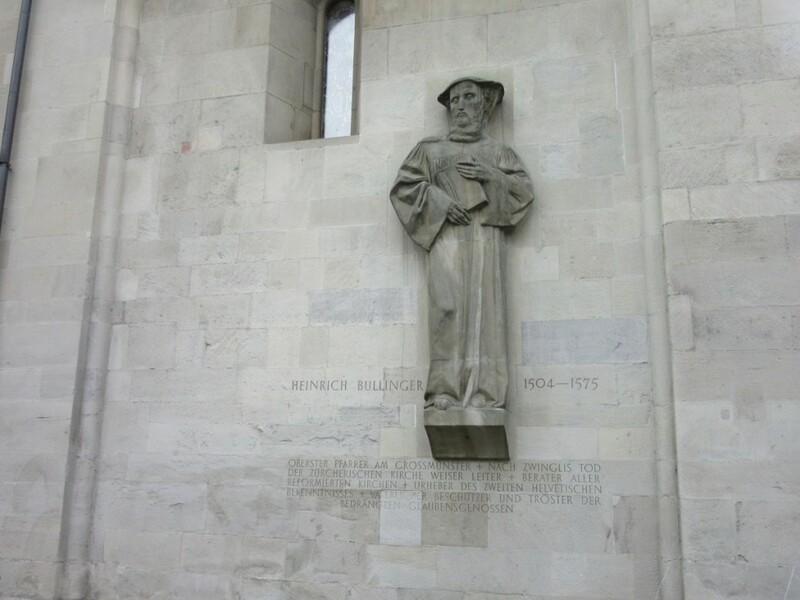 Heinrich Bullinger started the Reformation in Zurich. 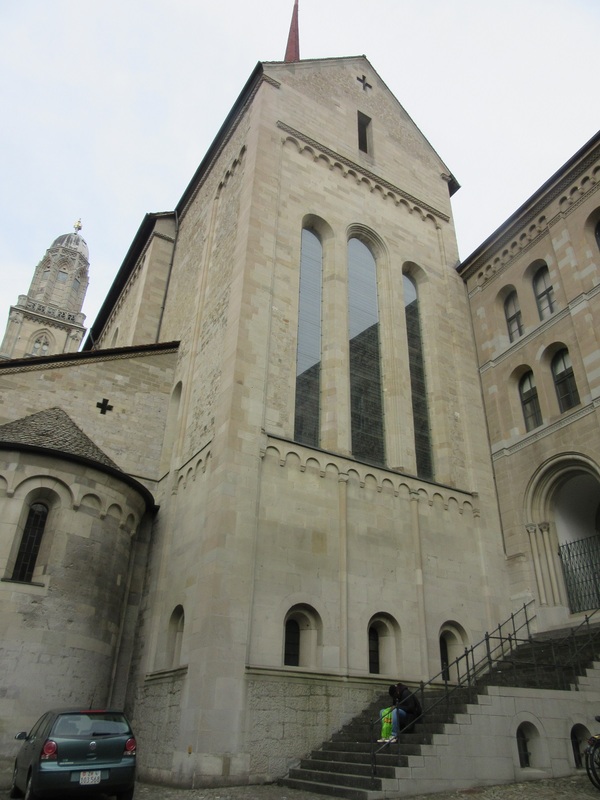 Going back even earlier in time when Rome ruled the land, 3 Catholic Priests tried to introduce the Catholic Faith to Zurich. They were beheaded on this spot for their efforts! 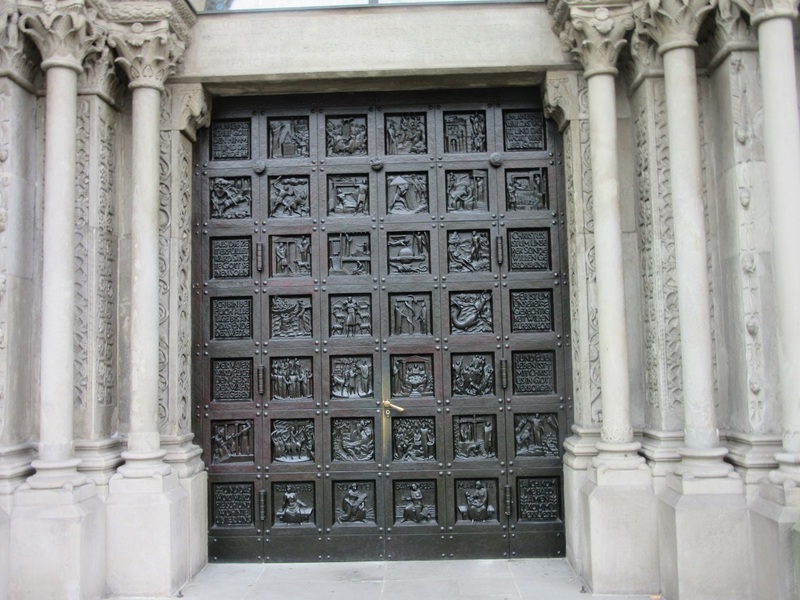 These massive carved wood and iron doors always capture my attention. The craftsmanship is not found today. 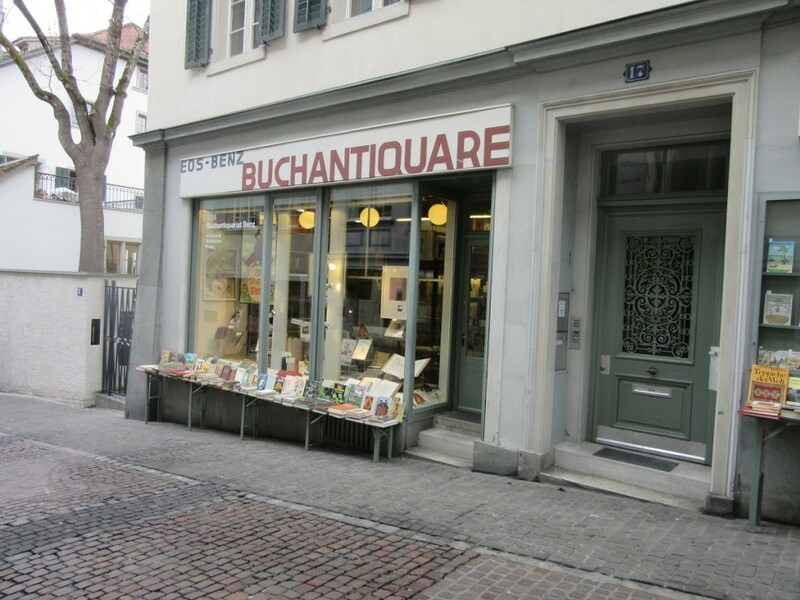 Winding my way back and forth and up and down the tiny cobbled streets I am just enchanted by my little discoveries like this Antique Bookstore. 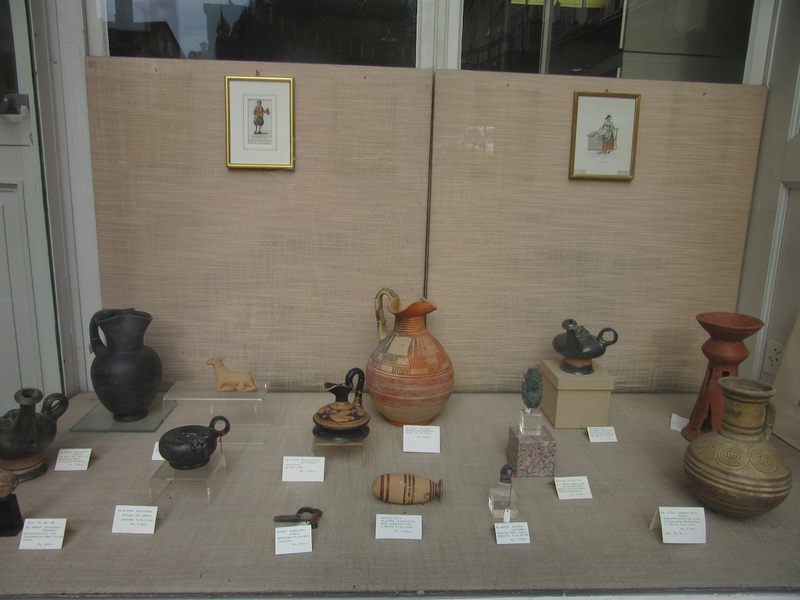 And this Antique Store featuring Etruscan Stoneware. The prices were eye popping! 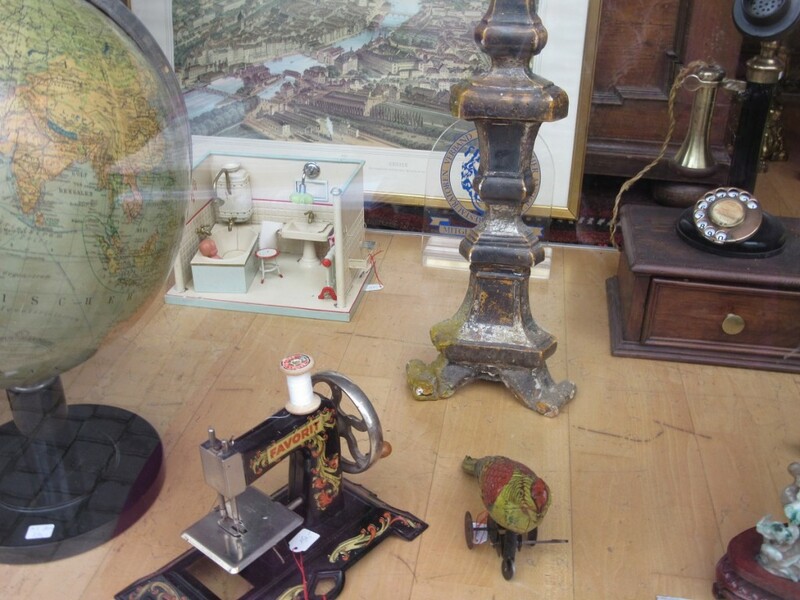 This Antique Shop was so charming with the dollhouse furniture, the toy sewing machine, the mechanical bird and the old standing telephone. 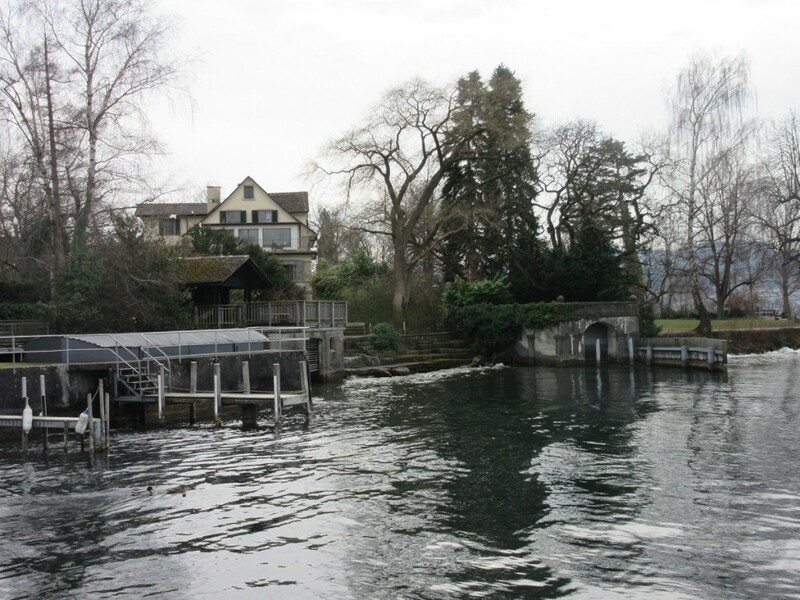 If you walk far enough you end up at the mouth of the Limmat where Lake Zurich empties into the river. Straight from the train station it takes 20 minutes or, if you wander like me, it can take 2 to 3 hours! 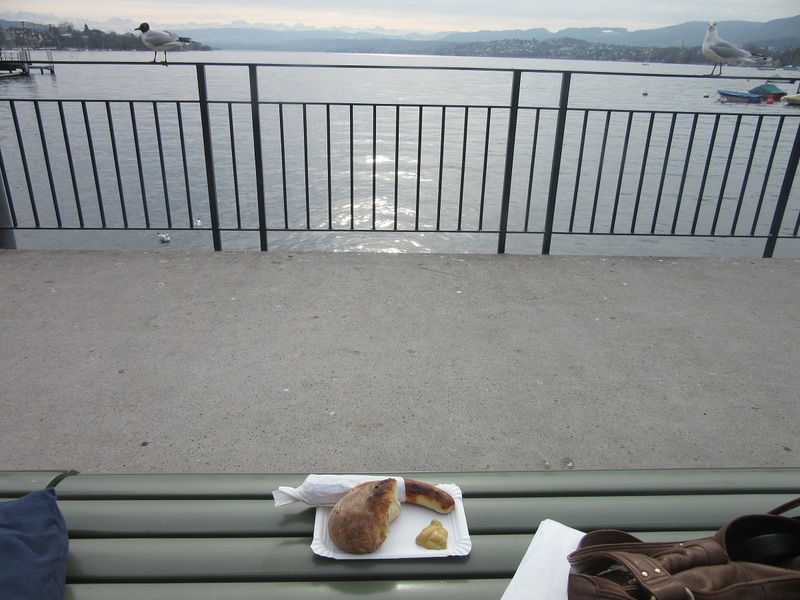 There I went to the Kiosk and bought a Bratwurst with a “hard as a rock” roll. It was very tasty and the Pigeons loved the bread! 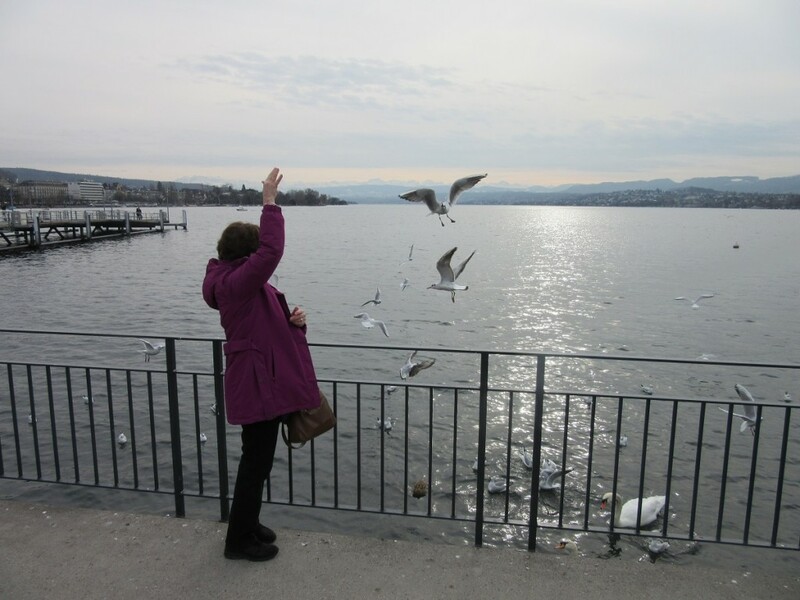 If you’re lucky like I was, you meet 2 gentlemen on Holiday from Turkey who take your picture feeding the birds and you take theirs. Yurgen and Hassan are school teachers whose mission was to find cheap air fares and visit several countries on each trip. They ( this made me laugh!) buy a refrigerator magnet and move on to the next country! 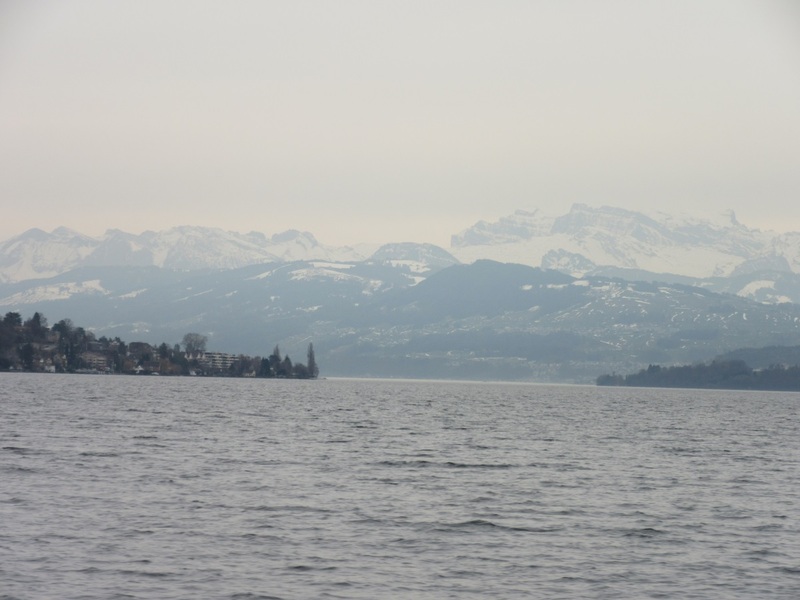 This trip was Zurich, Luxenburg and Lichtenstein. If you’re really lucky, you get on the tour boat with 50 other tourists plus Yurgen and Hassan and spend 2 hours talking our cultures, judicial systems, politics and making new friends as you admire the Alps from the boat! The boat is not only a tour boat but it makes several stops along the way taking residents to the next town or village. Very pretty trip soaking up some local scenes. The Alps peeking out through the overcast sky. Back on dry land, I start walking up the other side of the river and stopped to admire the little shops along the way like this one with the the pine cone walls! 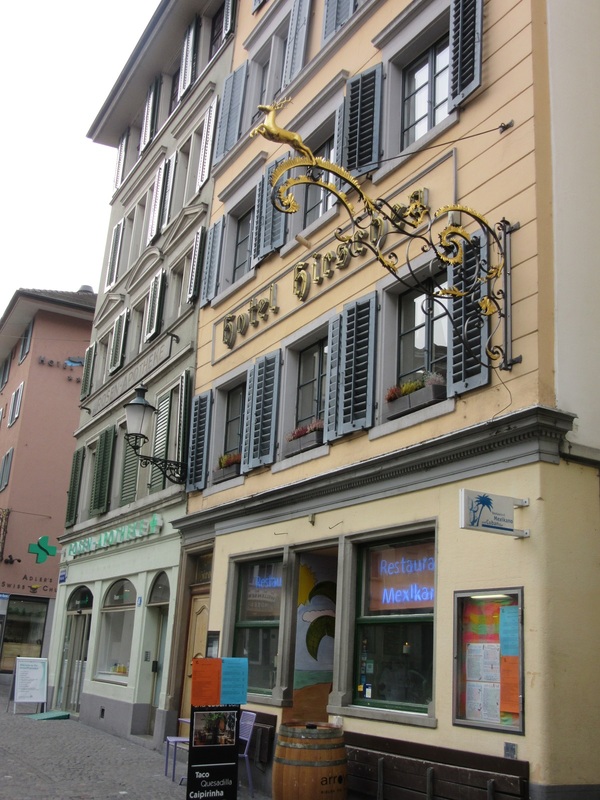 Small, private Hotels like the Hotel Hirschen with the gold platted metal Deer sign out front. “Hirsch” is German for “deer.” Mexican, Thai, Turkish, Irish, English, American. Restaurants from many countries! 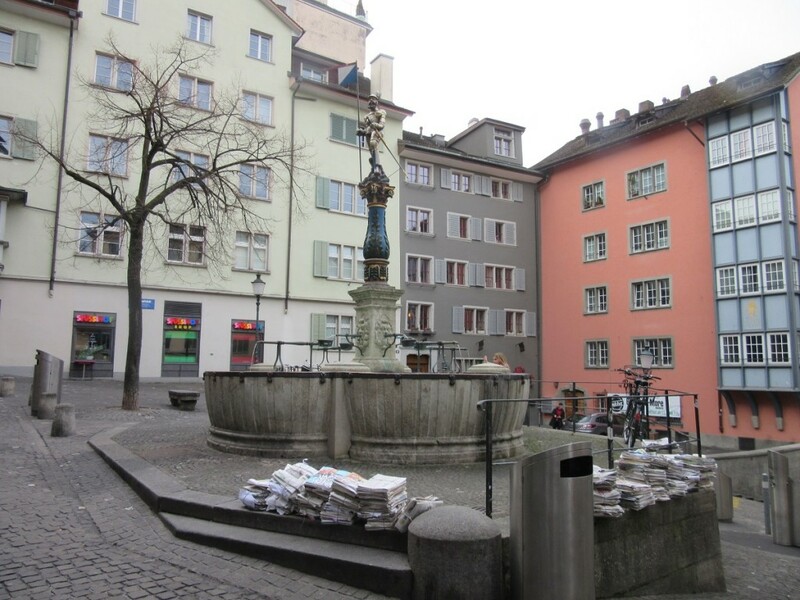 Every few blocks I came across a Platz with a statue of some local legend and a fountain. The fountains all have spigots for drinking water. I found this little apartment “bumpout” amusing. I bet the owners are the envy of their neighbors! 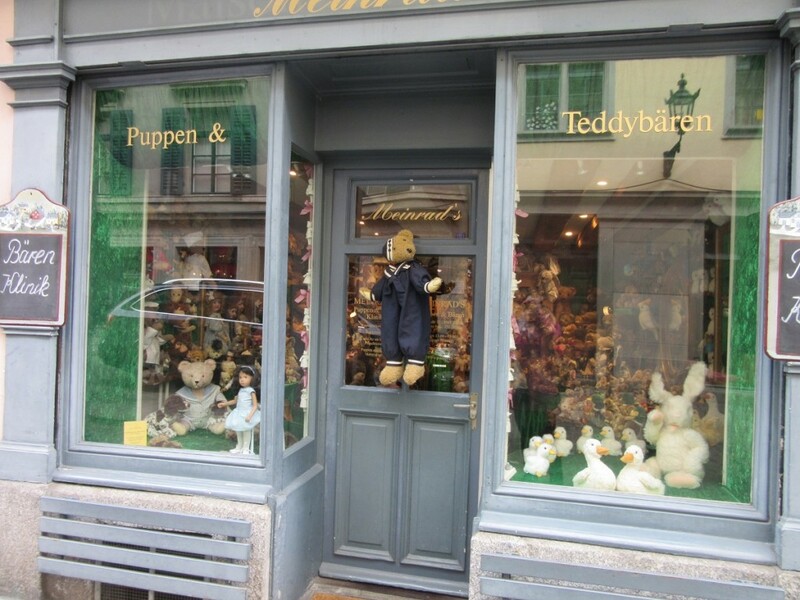 This little toy repair shop is stuffed with stuffed animals needing some TLC! Yes, prostitution is legal in Switzerland as it is in Germany and every town has its red light district. This one was discreet. 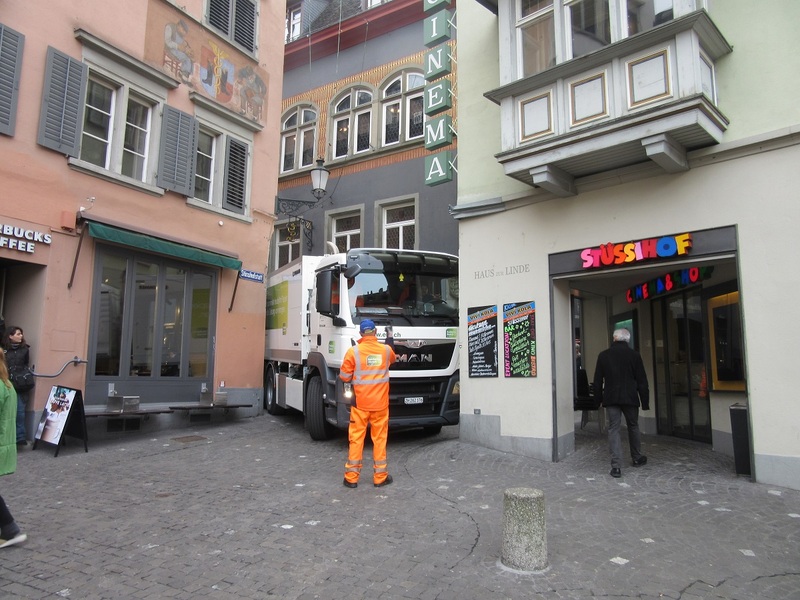 Having tiny, narrow streets does have it disadvantages, especially on garbage collection day! I watched fascinated as this driver with the assistance of 2 men directing him, successfully made this corner! 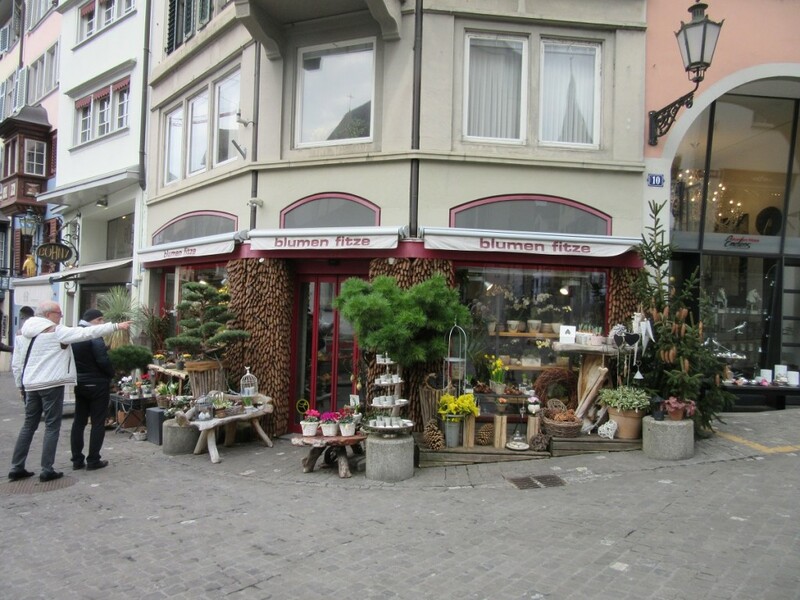 There are all kinds of specialty shops around every corner and I enjoy poking around and looking at all there is to see. 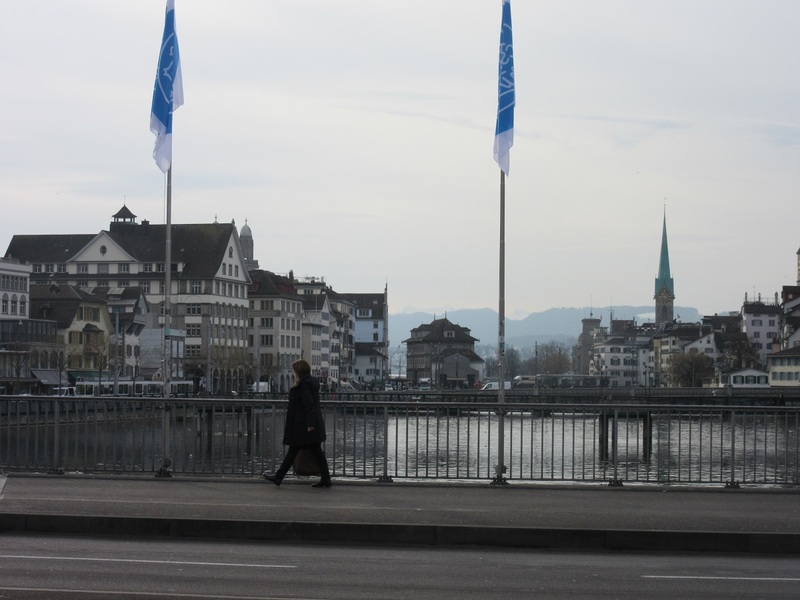 Zurich means money. Lots and lots of money! After all, it is the financial capitol of the world and believe me, you see examples of money at every turn. From Ferrari’s and Mercedes to 5 Star Hotels and Michelin starred restaurants. 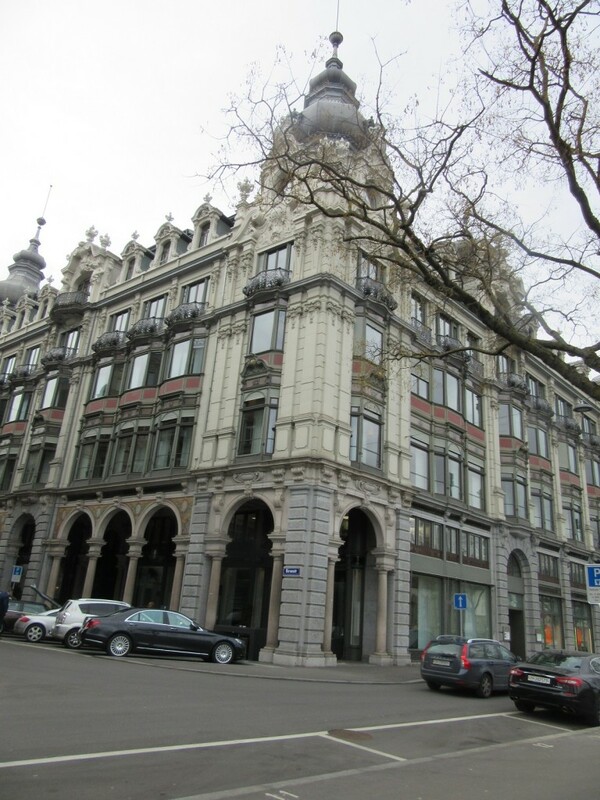 Banking and Insurance attracts the wealthiest people from around the globe. At the airport Dan counted 30 private jets! 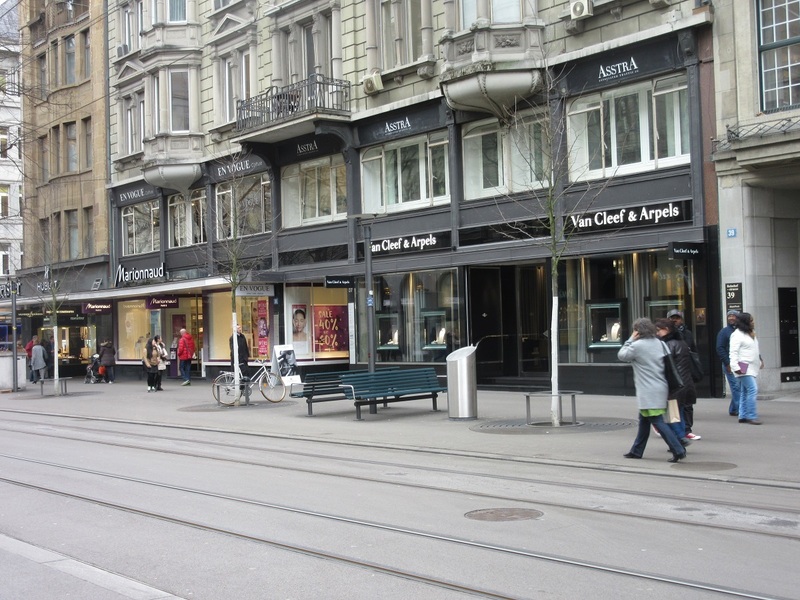 The Bahnhofstrasse has one designer store after another. Ferragamo, Louis Vuitton, Rolex, Prada, Armani and more! 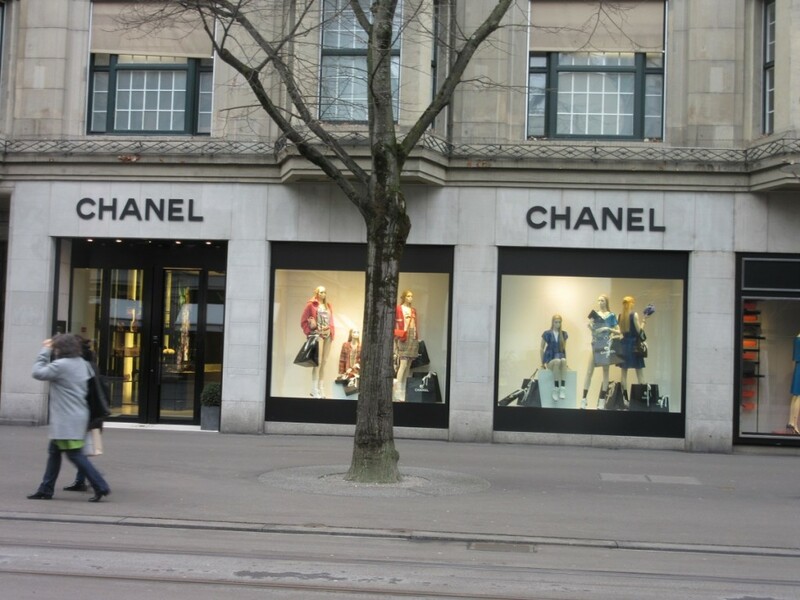 And my favorite, Chanel……sigh. I know I am out of my league when a pair of shoes at half price is $1,200! Well, back to reality and river walking and bird watching and enjoying the enormous pleasure of just being here! 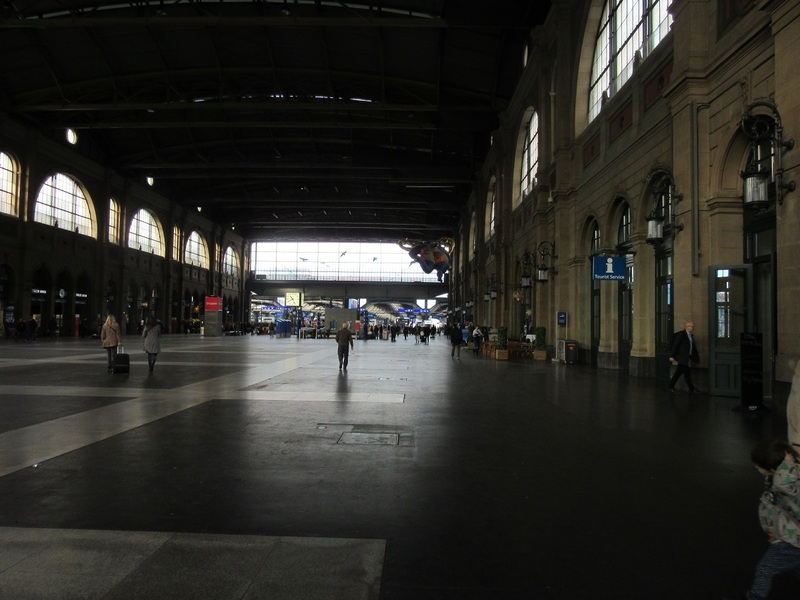 Eight hours later, tired, with very sore feet and a happy heart, I headed back upriver to the Train Station and and counted the 1,2,3,4 stops back to the Hotel. 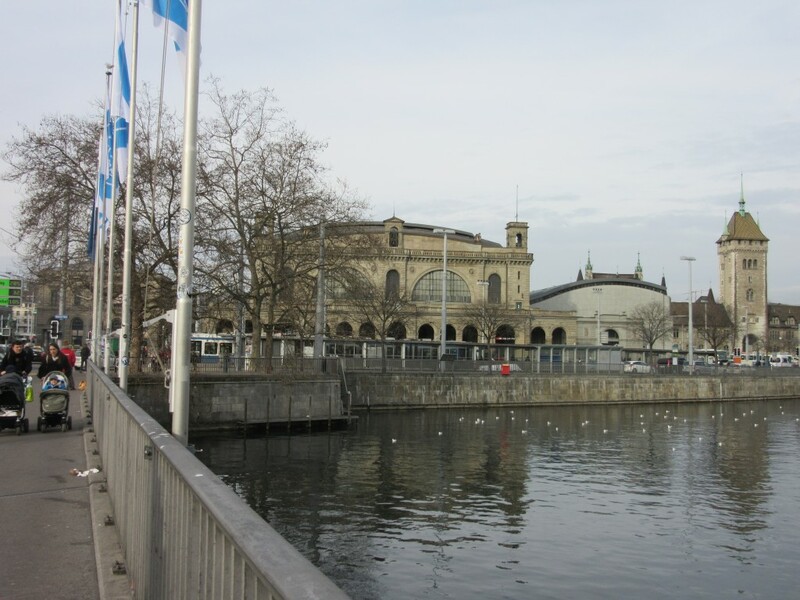 And so ended day one of my Zurich journey. A most satisfying day and one I am looking forward to continuing in the morning. Journey on! Just as an aside my friends. No, Dan is not concerned about me wandering these cities. He knows I am more than capable of looking out for myself. Basically he tells me “stay out of trouble, I don’t want to have to bail you out!” I always ask the Hotel and the Tourist bureau if there are areas to avoid. I am mindful of my surroundings. I practice all the common sense tourist practices the guide books tell you, like dividing my money in different locations and making sure my Passport is secured. European cities are generally very safe places to visit. So, I say, get out there and explore, meet new people, admire the history and just have fun! Thanks so much for stopping by today and letting me share my adventures with you. As always, Journey On!